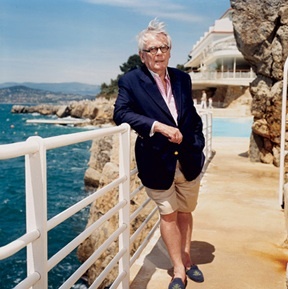 Currently browsing posts filed under "Dominick Dunne ’49"
.. originally published 1 October, 2008. 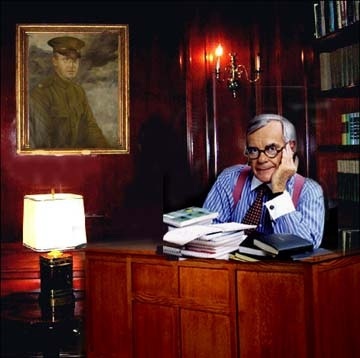 I am outraged that in all the in-depth discussion over a Williams distaff member of the press and her photo in Vanity Fair, not one word has been spoken about the obvious exploitation of Vanity Fair columnist and member of the class of 1949, Dominick Dunne. Certainly the ‘bedroom eyes and come-hither look’ so flagrantly manipulated for purposes too base to be mentioned, are worthy of the indignation of ephblog readers. And appearing in shirt sleeves in the Whittlesley Room of the Williams Club. Shame! Shame! As the new president of this organization, I had planned to write a thoughtful President’s Letter in a few weeks, but I am so upset by this exploitation of a revered member of the great class of 1949 that I have no choice but to protest. Griffin Dunne, son of the late Dominick Dunne, discusses his father’s life and last novel, Too Much Money, on The Leonard Lopate Show. Last evening, EphBlog received this plea from a member of the class of ’10: “I want to be an author. Please make me an author”. Alas, EphBlog with all of its power can only bestow the opportunity to post a person’s personal musings. To make one an ‘author’ is up to the individual. 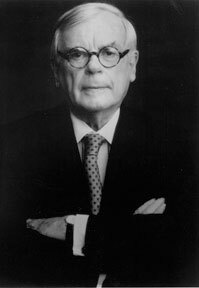 Dominick Dunne ’49 died in August of this year, a celebrity and an author. This story in ‘Vanity Fair’ helps us walk a mile in his shoes on that path to becoming one. EphBlog is powered by WordPress and delivered to you in 1.063 seconds using 32 queries..